Can it really be fifteen years? Seems like an awfully long time but yes, as I count them off on my fingers, it’s a full one and a half decades since I last kept chickens of my own. A lot has happened in that time which I guess is why it seems to have flown by so quickly but no sooner had I packed my new girls in their crate for the journey home than their soothing clucking brought back the happy memories of ownership and a big smile wrinkled my face. For the two weeks prior to their arrival I had been beavering away building a coop and run – a task that resulted in surprisingly few injuries considering my rudimentary woodworking skills. The two months prior to that was spent negotiating with Mrs Pocket Farm where said item would be situated in the garden. I have to say I was almost as excited to see if my coop design was successful as I was about getting the girls and after the first day all my trepidation was alleviated when they easily negotiated the ladder and the pop hole to cozy up together on the perch for the night. 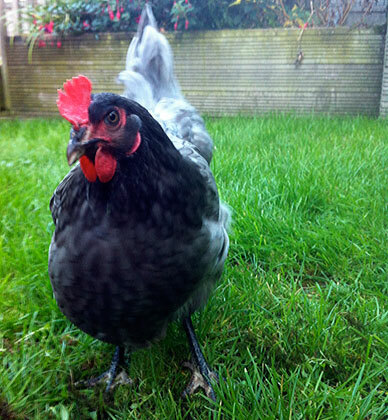 Mission accomplished – if a chicken can understand it right? The only modification I made to the original design, which was more of an oversight than a flaw, was the introduction of a side door to the run which made placing food and water, cleaning and shutting up infinitely easier. All those years ago I kept Pekins which made wonderful pets and still provided enough eggs (even at two for one size) to fulfil my requirements each week. They also made perfect parents for the hatching eggs I put under them every season with each chick that they ever raised making it to saleable age. However, this time I decided to opt for hybrids. There are so many varieties to choose from now that you can almost pick your favourite pure breed and find a hybrid ‘rip-off’ to match. 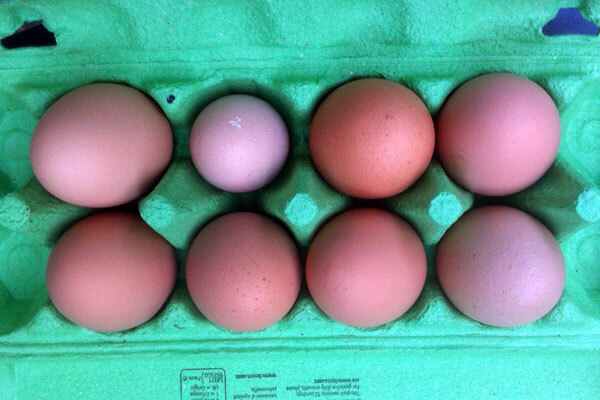 Light Sussex, Rhode Island Red, Cream Legbar, Marans, Wyandottes you can get ‘fakes’ of all these and more with the benefits of more consistent egg production, more resilience to disease – due to the fact that most are vaccinated – and a hugely reduced initial purchase price. In my opinion, unless you specifically want to show or breed, which clearly many of you will, it’s a no brainer. My choice a Black Rock, a Bluebelle and a Rhode Island Ranger subsequently named Betty, Flo and Mary respectively. The only last minute panic that arose was a double check around the garden for poisonous plants. Some had to be re-sited just to be on the safe side simply because anything that stands a chance of killing them will almost inevitably become their ultimate preoccupation. What’s especially nice when they are out free ranging is that, far from avoiding us, they will come over and sit on our laps for a quick fuss before strutting off to continue destroying the lawn and the borders. At 22-odd weeks they are just on point-of-lay and we have had a few good practices, as well as a couple of soft-shelled efforts probably brought about by an excess of treats that both me and my daughter lavished on them. Needless to say, these little luxuries are now banned, or at least vastly reduced, until they have settled into a better routine. Hopefully not long to wait as I am looking forward to the first home baked cake using their eggs. 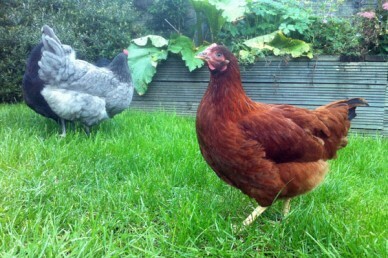 There is something about keeping chickens that is addictive, more so perhaps than any other smallholder stock. There is no doubt that they do have their own individual characters and that they are infinitely more intelligent than most people give them credit for. More than that though is the exchange that exists, the food and lodging for eggs, manure and slug removal services – trade and interdependence that is the essence of self-sufficiency. Not forgetting of course that they also make extremely attentive and affectionate pets. It’s great to have them around again after all this time… now just how many more can I squeeze in?